My husband Rob and I met in college and as I tell everyone, I won him on a bet.&bsp; My friend was sure he was gay, I was sure he wasn't and I set out to prove her wrong.&bsp; I won the bet and found the most wonderful thing to happen to me all at the same time.&bsp; We've been together for 11 years and married for 6 and I can barely remember what things were like without him in my life.&bsp;&bsp; My mother told me as I cried over broken heart after broken heart as a teenager to never settle for anything less than a man who cherishes you.&bsp; Rob not only cherishes me, but he keeps me safe and warm and marvels at how beautiful he thinks I am and how lucky he is every day.&bsp; He doesn't believe me when I tell him I'm the lucky one. 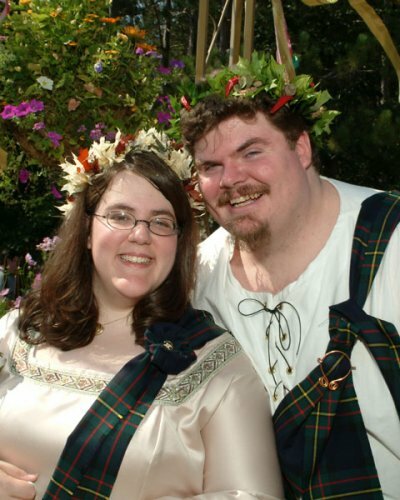 This photo is from our wedding at the Michigan Renaissance Festival on September 13, 2003 easily and without a doubt the best day of my life. Fat love is not a myth, I live it every day!